Pine trees are conifer type trees from the genus Pinus and Pinaceae family. There are approximately 105 to 125 species of pine trees throughout the world. Pine trees are known for the needle foliage and cone seeds that they produce and are grown for landscaping purposes, timber products and for use as Christmas trees. The white pine is a variety of tree that is hardy to plant in USDA growing zones 3 through 8 and prefers a moist, well drained soil. The tree grows to a height up to 80 feet with a 40 foot spread. 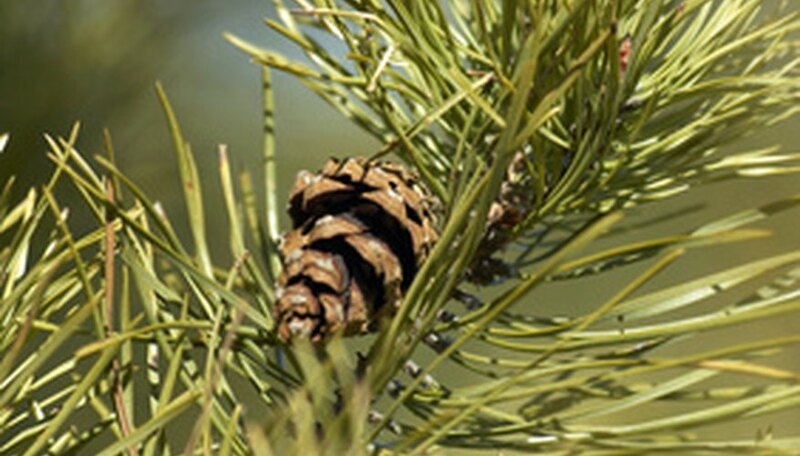 White pine has blue-green colored needles that grow in clusters and produces 6-inch-long cone seeds. This pine variety is easy to transplant and is desired as a windbreak or privacy screen due to the size it reaches. White pines are grown for Christmas trees and lumber production. The Scotch pine is a tree variety that is hardy to plant in USDA growing zones 3 through 7 and will tolerate mild drought conditions. This evergreen reaches a height up to 60 feet and has a double needle cluster that is 2 to 4 inches in length. Scotch pine trees are planted as windbreaks or as single trees and owls will often nest in the trees as they hold their needles for extended periods of time. The Scotch pine trees have a history of being planted along farm fields in the early 1900s, but they are now commonly grown as Christmas trees. The ponderosa pine is native to North America and reaches a height of up to 100 feet with a spread of 30 feet. The tree is hardy to plant in USDA growing zones 3 through 7 and prefers a well draining soil and full sunlight. Ponderosa pine trees are grown in landscapes as ornamental trees as they are fast growing, have a pleasant aroma and produce attractive gray-green, yellow and olive colored 5 inch long needles in clusters of three. Austrian pine trees are a hardy variety that tolerates high temperatures, drought conditions and poor soil. The tree is hardy to plant in USDA growing zones 4 through 7 and grows to a height of 60 feet with a 20 to 40 foot spread. Austrian pines are dark in color with simple, two-needle foliage that is 3 to 6 inches in length. This pine is often planted along streets, as windbreaks and in landscape backgrounds and is a desired nesting place for birds.